Plant bulbs are the gardening equivalent of birds' eggs. Instead of baby birds, however, they contain baby plants, and instead of yolks, they contain nutritious plant tissue to feed the new plants as they sprout and grow leaves to begin photosynthesizing. They also store food to feed future plants before going dormant each year. Gardeners have a choice of hundreds of colorful and fragrant bulb varieties to brighten their gardens from spring to fall. Turk's cap lily (Lilium superbum) grows wild in swamps, woods and wet meadows from southern New Hampshire south to Alabama and west to Arkansas. It’s known for abundant blooms, with 40 documented on a single plant. Hardy to winter temperatures of minus 20 degrees Fahrenheit and higher, this lily grows between 4 to 7 feet tall. It blooms between July and September with burgundy-spotted orange flowers. Tepals (petals and sepals) of the downward-facing blooms curve back to reveal long stamens with deep brown or black anthers. The Missouri Botanical Garden recommends this bulb for borders, native plant gardens and low wet areas. Plant in a moist to wet location with well-drained sand or loam soil and full to partial sun. Montbretia (Crocosmia), a southern African bulb hardy to winter temperatures of minus 10 degrees Fahrenheit, reaches up to 3 feet high and 18 inches wide. It's a clumping plant with sword-like green leaves up to 2 feet long. In July and August, montbretia’s branching stems produce ascending vivid red-orange buds that open from the top down. Montbretia, according to the Missouri Botanical Garden, accepts full sun where summers are cool. In hot areas, provide it with afternoon shade. Plant bulbs--after the last spring frost--3 to 4 inches deep and 6 inches apart. They need in moist, acidic, organically rich well-drained soil. Lift them the fall where winters are severe. Store them in dry medium and a cool location. 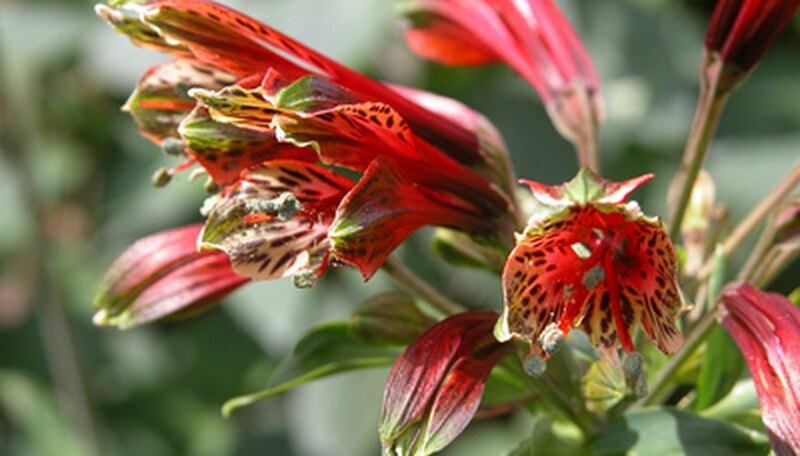 Lily of the Incas (Alstromeria) is a Chilean native bulb plant. With winter protection, it's hardy to USDA Plant Hardiness Zone 7 (minimum temperatures of 0 degrees Fahrenheit and higher). Standing up to 3 feet high and 2 feet wide, it has dense, elliptical 2-to-4-inch green leaves. In June and July, its stems bear long-lasting clusters of trumpet-shaped blooms. Yellow, orange and purple varieties, often splotched with contrasting colors, are available. Plant Lily of the Incas in a sunny location with light afternoon shade where summers are especially hot. It likes rich, averagely moist well-drained soil. Lilies grown as container plants will overwinter indoors with minimal watering. Lift those in the ground carefully--their roots are brittle--and bring them indoors them for storage in moist soil and a cool spot, advises the Missouri Botanical Garden.